Are Heel Spurs Causing Your Heel Pain? Tipton Podiatrists Explain. Do you have pain on the bottom of the heel and have been told it is because of a spur? This is a common explanation for this condition, but unfortunately it is rather inaccurate. Many people assume heel spurs cause pain, and many doctors not well familiar with foot disease also continue to refer to a spur as the cause of pain on the bottom of the heel. This has led to inadequate treatment of this common condition, which in reality is not difficult to treat once the real cause of heel pain is understood. Pain on the bottom of the heel is very rarely ever the fault of a spur in the heel bone. The vast majority of the time, heel pain is due to a condition called plantar fasciitis. 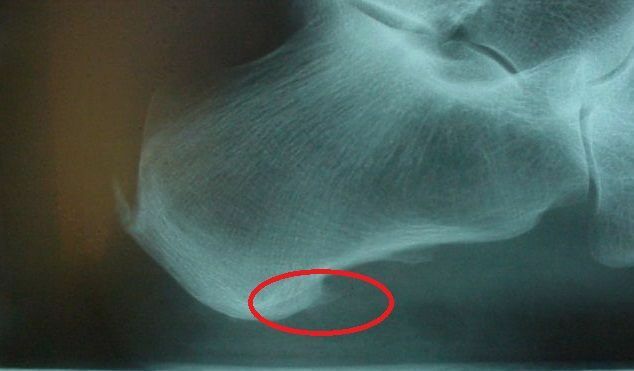 This condition consists of inflammation and partial damage to a ligament on the bottom of the arch that begins attached to the heel bone, and runs to the ball of the foot along the arch. The ligament, called the plantar fascia, is typically damaged over time due to strain from a flattening arch or excessive shock from a high arch. It can also be directly damaged in a sudden injury, although this is a less common cause of plantar fasciitis. As the fascia is slowly strained, the outer layer of the heel bone where the fascia attaches to reacts and begins to calcify in the direction of the strain. This essentially forms what appears to be a spur on x-ray, an enlargement of the bottom of the heel bone that runs parallel with the ground. Since it is not 'poking' downward into the skin on the bottom of the heel, it is not a source of pain as it is essentially an extension of the bottom of the heel bone. Heels spurs can occur in absence of plantar fasciitis and heel pain, as not everyone who has fascia strain due to their foot structure develops pain from it. Our doctors have seen thousands and thousands of x-rays of people with spurs who have never had heel pain in their lives. Since treatment needs to be directed to controlling foot strain and reducing inflammation of the fascia, measures taken to try and 'pad' the spur will be in vain. This is why diagnosing heel pain on the bottom of the foot as only being due to a spur will not lead to effective relief, and may even result in unnecessary surgery to remove the spur as a sole treatment. Like all things, there are exceptions. There is a role that a heel spur may play in heel pain. For those with inflammatory conditions like rheumatoid arthritis, a fluffy spur can form on the bottom of the heel which can itself be inflamed and cause pain. Also, some people may have very poor fat pad content in their heels, and any enlargement in the heel bone may be more easily felt when walking. This is primarily seen in the elderly and in those with poor circulation, although more often it is present when there is an abnormally large bulbous shape to the bottom of the heel bone rather than a specific spur. Finally, heel spurs can be directly related to foot pain when the spur occurs on the back of the heel instead of the bottom, where it irritates the Achilles tendon. This is an entirely different condition with its own causes and treatment.